Letters: Training -- Too Much of a Good Thing? "As part of the study contained in Public Law No. 112-96, the Commission has opened a 45 day period for comments to be filed on the issue," said ARRL Regulatory Information Manager Dan Henderson, N1ND. "Because of the short deadline for the study to be completed and presented to Congress -- before the end of August -- the ARRL and the amateur community must quickly mobilize their response." "This study is not about zoning ordinances or regulations adopted by the local or state governments," Henderson explained. "Amateurs already have the limited protection of PRB-1 to assist them with those situations. The areas of concern here are the limitations that are placed on a property when it is purchased, either as part of the deed of sale or by restrictions imposed by the neighborhood/homeowner's association. Those restrictions -- sometimes referred to as CC&Rs -- are not currently covered by the FCC's PRB-1 decision from 1985." "Whether you are an ARRL member or not, your information and situation are important to helping us make the case for all amateurs," Henderson said. "Whether your support communications are with ARES®, RACES, SKYWARN, CERT or other emergency and disaster groups, your voice should be heard. If you cannot operate effectively from home during an emergency because CC&Rs prohibit adequate antennas on your property, that is important to document and quantify. This issue affects all of Amateur Radio, not just ARRL members." Henderson said that due to the short timeframe that the FCC has allotted for public comment, time is of the essence. In order to allow the ARRL to develop its comments, the ARRL asks that all information sent by the amateur community be received at the ARRL no later than April 25, 2012: "We realize this is a very short turnaround asking for your response, but this is based on the time provided by the Commission for the comment window." "We need factual, specific details," Henderson said. "The more accurate information we have -- including copies of the CC&R language -- the stronger case we can make. Having copies of the exact CC&Rs is important. It allows us to demonstrate the wide variation of restrictions. Including the specific text is as important as any other piece of information you provide." If you have questions about what is being requested, you may contact the ARRL Regulatory Information Office via e-mail. "Again, time is of the essence in this matter," Henderson said. "This is the best opportunity that amateurs have had to address the impact of overly burdensome private land use restrictions. 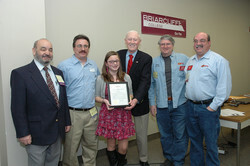 If Amateur Radio is to succeed in this effort, it is going to take all of us working together." How often is the Amateur Radio station at your local emergency operations center on the air? Only during emergencies? For nets? For training? In many cases the EOC Amateur Radio station may only see activity when it's needed, but this really shouldn't be the case. This Amateur Radio station plays two critical roles. First it is the station you will rely on during an emergency. Not just for the operator at the EOC, but all those communicating with your EOC via Amateur Radio. Second, it is your Amateur Radio showcase to your served agencies. Putting this station on the air, not just regularly but as often as possible, accomplishes several things. Each time you are on the air you are training. You are learning about propagation, band conditions, and improving your operating skills. In doing this you also learn more about your station. You learn its strengths and weaknesses, its capabilities, and you become more familiar with the equipment. Finally, you learn to identify problems in the station. Through regular activity you develop a baseline of how the station should perform. When something goes wrong you will know it quickly and be better prepared to fix the problem. This on the air activity also has other potential benefits. As you and your group spend more time exercising the station your served agency will take notice. They will see that this station has value. They may even take interest in how well it is performing. And don't forget that through activity you are given the chance to promote the Amateur Radio Service. Remember there's more to it than emergencies and public service, don't miss an opportunity to show off the other facets of our great service. The opportunities to get on the air are diverse. Your group could make it a goal to add an operating achievement to the wall such as DXCC or Worked All States. Participating in a contest is a great way to hone your operating and traffic handling skills (a contest exchange is traffic!). It also provides a great way to test your station's capabilities. You can also design a friendly in-house competition between operators, and see who can make the most QSO's each month or log check ins to HF nets. The National Weather Service Forecast Office in San Juan, in coordination with the Puerto Rico Seismic Network and the Caribbean Tsunami Center prepared the exercise called LANTEX12. The purpose of this exercise, held on March 28 at precisely 9:04 am AST, was to support tsunami preparedness efforts throughout Puerto Rico and U.S. Virgin Islands. The exercise tested sirens, the Emergency Alert System (EAS) and how well messages get on the air on local radio, TV, cable and other outlets. Also tested were evacuation procedures in public schools around the island. The drill scenario was an earthquake off the shores of South Carolina, and the Tsunami wave it would create. Angel Santana, WP3GW, reported that he was present at the Agencia Estatal de Manejo de Emergencias y Administración de Desastres- AEMEAD (Puerto Rico Emergency Management Agency - PREMA) central offices, and served as Net Control using the KP4CVR call of the Cuerpo de Voluntarios Radioaficionados team, for which he is a volunteer. Santana was on the KP4CAR - 147.210 Mhz repeater system taking reports from all eleven Zones in which rhe agency divides the island. [The KP4CAR repeater is sponsored by Carlos A. Rosado, KP4CAR, the owner and trustee, and is one of the best situated on the island -- during Hurricane Irene it was one of the few on the air.] The agency wanted to know how Amateur Radio operators learned of the activation to have an idea of which communication systems worked best. Amateurs from Mayagüez up to the island of Vieques reported in. There were several others on other repeater systems and on HF participating in the drill. Here is a TV report about the exercise. Satellite telephones were also used, and the KP4 Amateur Radio operators net was activated. As an aside, AEMEAD Director Heriberto Sauri lamented that only one cellular company participated in the exercise -- some cell phone companies were under fire last year for not sending any test messages as planned. On August 27 and 28, 2011, for 28 hours during Tropical Storm Irene, 13 year old Jennifer Melfi, KC2TMA, assisted the Town of Babylon (New York) Emergency Operations Center by calling for volunteers on the radio several hours before the storm struck. She tirelessly provided emergency communications, relaying information about shelters and highways to Town of Babylon officials, Red Cross shelters and other nets throughout Long Island. March 23, 2012 was the date of the Outdoor Resort Palm Springs (ORPS) Emergency Preparedness Expo. Local Palm Springs KESQ channel 3 TV reporter Bianca Rae interviewed Coachella Valley EC John Polak, NF6N, which made the evening news broadcast. In addition to RACES, the Cathedral City Fire Department, Riverside County Emergency Services, American Red Cross, FEMA, Costco, Palm Springs Community Emergency Response Team (CERT) and the ORPS Safety & Security Committee also participated. In re the last issue's item on FEMA course IS-201, it is really based on the forms used in the ICS's Planning Section. That doesn't mean that the other sections are not involved but it does work mostly with planning forms to make it around what is called the "Planning P" to put a "Plan" in the Incident Commander's hands at the proper time. The Plans folks live in the future and not so much in the "now" or "past." They take what the Incident Commander wants to do in the NEXT period and put it on paper. If he wants to be in front of the fire with ten fire trucks and 100 people and planning finds out that there are only 5 fire trucks and 50 people on hand, they will contact Logistics to make sure that the additional supplies will be on hand BEFORE that next period begins. They will determine from the Operations folks what they will need to make all of this happen. They may need more food, water and porta-potties. As soon as this "new plan" is put into place at 0600 (or whatever time the Incident Commander says it will happen), Planning moves on to the NEXT operation period. So again, they live at least 12 hours into the future. There is a saying that if the Planning section has nothing to do for that next operational period, then their job is to "plan the demobilization." If there is nothing to do, you don't need that many people or that much equipment. The Eighth Global Amateur Radio Emergency Communications Conference (GAREC) -- called MyGAREC 2012 -- will be held November 12-14 in the Malaysian state of Negeri Sembilan at the Thistle Port Dickson Resort. GAREC -- which began in 2005 in Tampere, Finland -- attracts radio amateurs who have an interest in providing emergency communications in response to disasters or during training exercises. MyGAREC 2012 has been timed to immediately follow the IARU Region 3 Conference in Vietnam (scheduled for November 5-9) with its theme of disaster relief communications. General information for MyGAREC 2012 -- including information on the venue, registration fees the tentative agenda and registration forms -- has been posted on the MyGAREC website. According to organizers, the website will be updated weekly with the latest news and program changes. Among the topics to be discussed include the HF emergency operating procedure and the future of GAREC, as well as presentations from the three IARU regions. Presentations from various IARU Member-Societies regarding recent disaster relief communications operations will also be scheduled. In March QST you wrote about ICS, CPR and AED training for volunteers. I spent 16 years as a volunteer in Emergency Management and I am an instructor for NIMS and when I read your write up I could not believe what you are asking volunteers to do. Yes, they need IS courses 100, 700 and 800 but unless they are going to be a leader and have the full knowledge of Emergency Management I don't see that the volunteers need courses 230, 250, 288 and the others that deal with the EOC. If you are in a rural area your EOC could be out of your house or work for an Emergency Manager who doesn't even have the ICS training. As a volunteer I feel -- along with our club -- that the other classes are not necessary. You have to realize that the rural areas don't have DSL, and dial up Internet won't let you take some of these classes online. I feel that if ARES volunteers take IS courses 100, 200 and 700 then they have the knowledge to assist in an emergency. Remember, they are volunteers and have regular jobs, families and other commitments. The FCC said "We pose specific questions below to provide structure for commenters. Commenters may also address questions not set forth below that relate to the topics of the study to be submitted to Congress. Commenters should not, however, view this Public Notice as an opportunity to seek Commission rulings regarding specific situations." 1. Importance of emergency Amateur Radio Service communications. As noted above, the statute requires a review of the importance of emergency Amateur Radio Service communications relating to disasters, severe weather, and other threats to lives and property. a. What are examples of disasters, severe weather, and other threats to life and property in which the Amateur Radio Service provided communications services that were important to emergency response or disaster relief? Provide examples of the important benefits of these services. advantages over other communications systems in supporting emergency response or disaster relief activities? Under what circumstances does the Amateur Radio Service complement other forms of communications systems for emergency response or disaster relief? c. What Federal Government plans, policies, and training programs involving emergency response and disaster relief currently include use of the Amateur Radio Service? What additional plans, policies, and training programs would benefit from the inclusion of Amateur Radio Service operations? How would Amateur Radio Service operations fit into these plans and programs? d. What State, tribal, and local government plans, policies, and training programs involving emergency response and disaster relief currently include use of the Amateur Radio Service? What additional plans and programs would benefit from the inclusion of Amateur Radio Service operations? How would Amateur Radio Service operations fit into these plans and programs? f. What training from government or other sources is available for Amateur Radio Service operators for emergency and disaster relief communications? How could this training be enhanced? Should national training standards be developed for emergency communications response? g. What communications capabilities, e.g., voice, video, or data, are available from Amateur Radio Service operators during emergencies and disasters? Are there any future technical innovations that might further improve the Amateur Radio Service? h. Are national standards in data transmission needed to enhance the ability of Amateur Radio Service operators to respond to emergencies and disasters? Are there restrictions with regard to transmission speeds that, if removed, would increase the ability of operators to support emergency/disaster response? If so, what issues could arise from removing these restrictions? i. Would it enhance emergency response and disaster relief activities if Amateur Radio Service operators were able to interconnect with public safety land mobile radio systems or hospital and health care communications systems? What could be done to enable or enhance such interconnections? What issues could arise from permitting such interconnections? j. Should there be national certification programs to standardize amateur radio emergency communications training, mobilization, and operations? How would such programs improve emergency communications? 2. Impediments to enhanced Amateur Radio Service communications. The statute also requires that the study identify impediments to enhanced Amateur Radio Service communications andrecommendations regarding the removal of such impediments. minimize the effects of these restrictions? use restrictions from reasonable and necessary restrictions? How do local circumstances, such as neighborhood density or historic significance, affect whether a private land use restriction is reasonable or necessary? How does the availability of alternative transmitting locations or power sources affect the reasonableness of a particular private land use restriction? c. What steps can amateur radio operators take to minimize the risk that an antenna installation will encounter unreasonable or unnecessary private land use restrictions? For example, what obstacles exist to using a transmitter at a location not subject to such restrictions, or placing an antenna on a structure used by commercial mobile radio service providers or government entities? d. Do any Commission rules create impediments to enhanced Amateur Radio Service communications? What are the effects of these rules on the amateur radio community's ability to use the Amateur Radio Service? Do disaster and/or severe weather situations present any special circumstances wherein Commission rules may create impediments that would not otherwise exist in non-disaster situations? What actions can be taken to minimize the effects of these rules? e. What other impediments to enhanced Amateur Radio Service communications have amateur radio operators encountered? What are the effects of these impediments on the amateur radio community's ability to use the Amateur Radio Service? Specifically, do these impediments affect the amateur radio community's ability to respond to disasters, severe weather, and other threats to lives and property in the United States? What actions can be taken to minimize the effect of these impediments? f. The legislation requires the Commission to identify "impediments to enhanced Amateur Radio Service communications. "7 What specific "enhance[ments]" to Amateur Radio Service communications have been obstructed by theimpediments discussed above?